Brookwood Cottage is a thatched cottage set on the outskirts of Cong in Ireland. It provides five bedrooms comprising of four doubles and a twin room, there is also a family bathroom and a shower room, the property can sleep ten people. The interior also comes with a kitchen/diner, a utility, and a sitting room with a woodburning stove. To the outside there is off road parking for four cars and surrounding lawns. 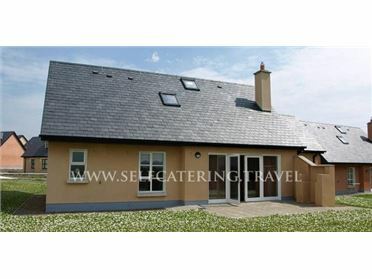 Brookwood Cottage is a splendid cottage in a perfect location for exploring County Mayo. Cong, the gateway to Connemara, lies between the shores of Lough Corrib and Lough Mask in County Mayo. Well-known Ashford Castle is nearby, offering fine dining and a golf course. The 'City of Festivals, Galway, is within driving distance with its nightlife. Oil central heating and woodburning stove. Electric oven and hob, microwave, fridge/freezer, dishwasher, washing machine, tumble dryer, Sky TV, WiFi, selection of books and games. Cot and highchair. Fuel, power and starter pack for woodburning stove included in rent. Bed linen and towels included in rent. Off road parking for 4 cars. Garden with furniture. Sorry, no pets and no smoking. Pub, shop and restaurant 1 mile..